Architectural castings are the extra features that make a building distinctive. Most buildings have walls, a ceiling, and a floor, but details such as columns, molding, and bas relief distinguish a structure and make it unique. Stromberg has been doing GFRC architectural castings for 30 years. Using glass fiber reinforced concrete, Stromberg can mold almost any architectural feature or casting. We made the tallest columns in the world for Caesar’s Palace in Los Vegas, Nevada. They are flanked by the tallest pilasters in the world. Of course, the bases had to be custom designed and made, too. Several other features for both the interior and exterior of the hotel were cast by Stromberg GFRC. No matter how crazy your architectural vision, we can help you realize it with GFRC. GFRC architectural castings are not limited to huge installations such as Caesar’s Palace. Stromberg GFRC can also be used when matching older buildings such as the Old Parkland Hospital in Dallas, Texas. Crow Holdings purchased the old hospital grounds to use as a headquarters. When they needed a new building, they wanted to build one that would blend in with the others. 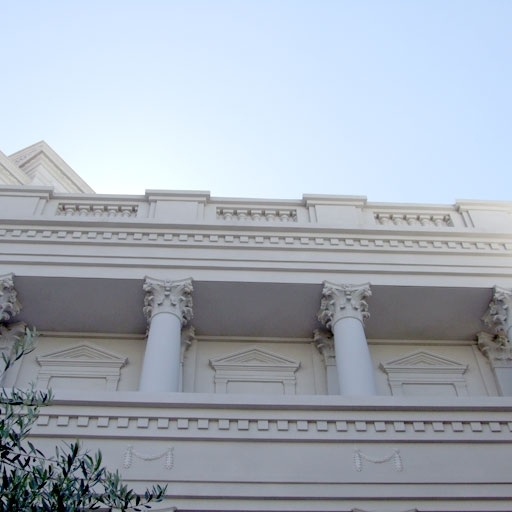 The columns, cornice, and balustrade for that building were made by Stromberg out of GFRC. Lightweight and durable, they could be stained to exactly match the materials on the old buildings. The results helped Crow Holdings win the first ever Sustainability Award from the Dallas Chapter AIA in 2007. Whether you are looking to undertake a massive renovation, or you just need a few, small, custom architectural castings, Stromberg has you covered. If you are in the market for architectural castings, you owe it to yourself to contact us and ask about Stromberg GFRC. Who knows in a few years we may be writing about the awards your project won. For more information and assistance with your design challenge, please call us at (903) 454-0904 today or email us at info@strombergarchitectural.com.